The Command Under Sink Cabinet Caddy is great for neatly organizing your cleaning supplies and tools. Forget about nails, screws and tacks, Command Products are fast and easy to hang! Uses revolutionary Command Adhesive to hold strongly on a variety of surfaces, including paint, wood, tile and more. Removes cleanly - no holes, marks, sticky residue or stains. Rehanging items is as easy as applying a Command Refill Strip, so you can take down, move and reuse items again and again! Contains 1 caddy and 4 large foam strips. Holds up to 7.5 lbs. Command Outdoor Designer Hooks give you the freedom to decorate the outside of your home for every season, holiday or event, and are available in a wide range of designs to match your individual style and decor. They come in a variety of sizes and hold a surprising amount of weight! Command Damage-Free Hanging Hooks hold strongly on a variety of surfaces, including paint, wood, tile and more. When you are ready to remove your Command Hook, it comes off cleanly without damaging surfaces with holes, marks, sticky residue or stains. Modern Metal Key Caddy, HOM-19SS-C Command Decorative Hooks come in a variety of styles, from sophisticated to sleek and modern, giving you options for every room and every person in your home. The Command Modern Metal Key Caddy is great for organizing mail and hanging keys in the entry way, mudroom and family command centre. 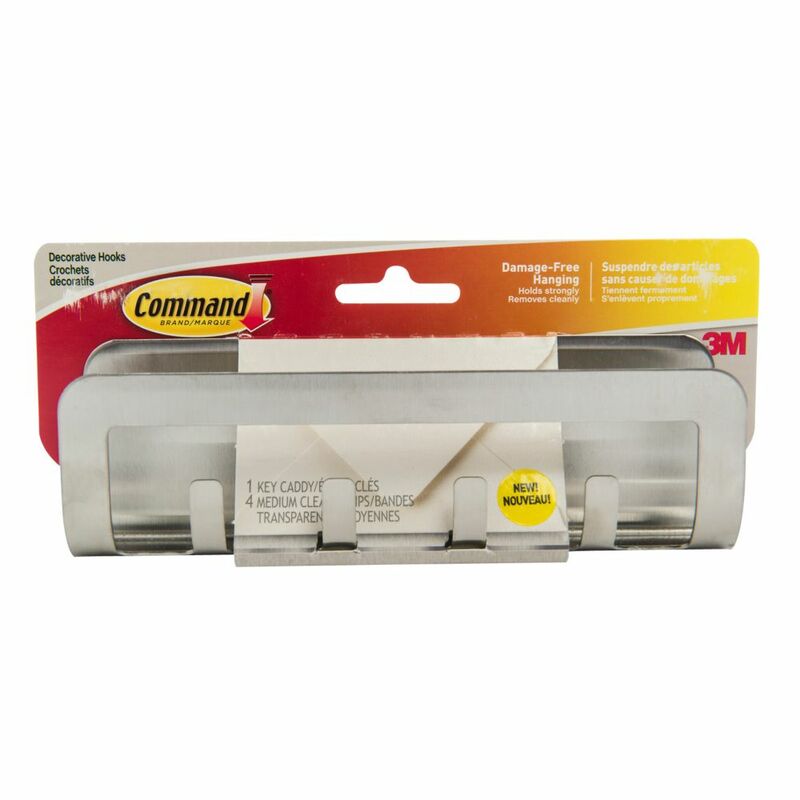 Using the revolutionary Command Adhesive, Command Decorative Hooks hold strongly on a variety of surfaces, including paint, wood, tile and more.